(CNN) -- A man shot and killed seven patients and a nurse at a Carthage, North Carolina, nursing home Sunday before being wounded during a shootout with a police officer, authorities said. 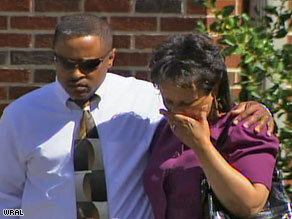 Relatives of the nursing home's patients gathered at a nearby church, where they learned details of the shooting. Three other people, including the police officer and a visitor to the nursing home, were wounded in the attack, Carthage Police Chief Chris McKenzie said. The police officer was treated and released, McKenzie said. The slain patients ranged in age from 78 to 98, Moore County District Attorney Maureen Krueger said. The man accused of carrying out the attack, 45-year-old Robert Stewart, was in custody, and his condition was unknown Sunday night, McKenzie said. Stewart was not an employee of the Pinelake Health and Rehab Center, and he did not appear to have been related to any of the patients, she said. The doctor "said he undoubtedly saved a lot of lives," Avant Sr. said, speaking of his son. Stewart faces eight counts of first-degree murder and one count of felony assault on a police officer, and other charges are pending, she said. Sunday's slayings were the latest in a series of high-profile in March, including the killings of 10 people by an Alabama man who was then killed by police. In addition, a man shot and killed a pastor in a southern Illinois church and stabbed two parishioners, and a 17-year-old in Germany killed 15 people in two small towns before dying in a shootout with police. In Carthage, crisis counselors were setting up in the town's First Baptist Church to aid survivors of the latest killings. "I don't know the emotion entirely has set in," McKenzie said. "This is a small community built on faith, and faith will get us through."